The next best thing to owning your own real-world modular system, Bazille is an incredible virtual synth that's an absolute joy to use. Hugely powerful oscillators. Brilliantly designed architecture. Packed with features. Sonically stunning. Very reasonably priced. Mapping Generator could do with more presets and save capability. Can be fairly CPU-taxing, even with HQ mode disabled. Combining powerful digital oscillators with an analogue-style semi-modular architecture, Bazille, the long awaited new synth from u-he (the makers of Diva and ACE) is a sound designer's dream come true. 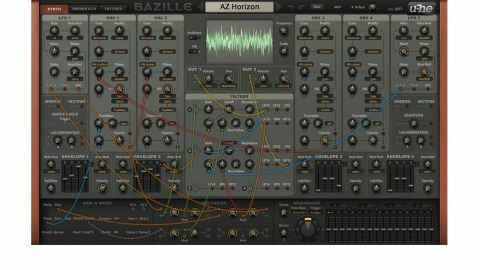 Hopes for Bazille couldn't be higher: it's been in development for the last half-decade and comes from the developer of such classic soft synths as Zebra 2, ACE and DIVA. "Bazille doesn't make any distinction between modulation and audio signals, and any output can be plugged into any input"
Happily, we can report that u-he's latest not only lives up to expectations, but surpasses them. In fact, it's without doubt one of the finest software instruments ever made. The primary reason why Bazille is so successful is its fluid architecture. Like its spiritual predecessor, ACE, it doesn't make any distinction between modulation and audio signals, and any output can be plugged into any input. This makes it possible to generate audio signals from modulation sources and modulation signals from oscillators, and for the synth's myriad signal processors to be applied to anything you care to push through them, including the output of the built-in sequencer! This all comes together in a fun, creative environment for less experienced synth programmers, and an awesomely powerful tool for pros. Bazille's four oscillators are ridiculously flexible. The waveform of each is a cosine by default, but you can switch the signal to either of the synth's two editable Mapping Generators. The pitch section enables transposition of each oscillator by not only Semitones but also Overtones (harmonics) and Undertones (sub-harmonics). You can also set a fixed pitch in Hertz and even sync the oscillators to the host tempo in Clocked mode. As well as their versatility in terms of general pitching, these modes come in very handy when using the oscillators as FM modulators. There's also a fine tune knob, the range of which can be set to Cents, 5 Hertz, Beats or Multiply, the last multiplying or dividing the frequency by a constant value. The 5 Hertz range is particularly useful, making it possible to create detuned sounds that beat together at a constant rate, no matter what pitch the triggering note is at. The oscillator panel also features a dedicated section for Phase Modulation (more commonly - if erroneously - known as Frequency Modulation). This offers a variety of modes including linear and relative FM; and a Phase parameter, which can be assigned to Gate, Random (emuating free-running analogue oscillators) or an alternative free-running mode called Catch, where each voice gets its phase from the end of the previous note. Next up is Phase Distortion, which basically works like a waveshaper, giving the user the ability to select two waveforms that each shape alternate cycles of the incoming signals. For example, selecting Saw and Square and turning the Phase Distortion parameter all the way up will transform an incoming sine wave into alternating saw and square shapes. The Phase Distortion amount can be modulated, delivering extremely satisfying, crunchy harmonics, especially when used to process a harmonically complex input from the Mapping Generator. Last but not least in the oscillator panel is the Fractal Resonance section. Here, you select a waveform (Saw, Triangle or Max) and turn the amount parameter up to 'pack' increasing numbers of cycles of the signal into a 'window' defined by the selected waveform -it needs to be experienced to be fully appreciated. It's not a system we've come across before, and in terms of sound it sits somewhere between classic hard-sync sounds and the kind of screechy formant effects you might coax out of Native Instruments Massive. Once you've got your base oscillator signal established, there are plenty of places to which it can be routed. The most obvious destination is the filter panel, which includes two main filters with Gain knobs for driving the signal, and the ability to self-resonate. "It stands as a genuinely viable alternative to a hardware semi-modular system"
Rather than switching between modes, each filter has six outputs - one for each mode: LP6, LP12, LP18, LP24, BP6 and HP12. This makes it possible to use the outputs of multiple filter types simultaneously. The panel also includes two auxiliary filter with 'just' LP18, BP6 and HP12 outputs, the controls for which are hidden away on the instrument's Tweaks & FX page. The filters sound great, and further sound mangling is afforded by the Multiplex panel, wherein signals can be mixed, and ring and amplitude modulation applied. There are also Inverter, Rectifier, Sample & Hold and Quantizer processors, plus four envelopes (featuring a useful Snappy mode, which reduces the range of the Decay and Release faders for fine-tuning), two LFOs, two Lag Generators, two Ramp Generators, and a Sequencer than can morph between eight patterns. Bazille also boasts the ability to stack up to eight voices, each of which can be individually detuned to make the synth sound even phatter than it does anyway. And finally, the effects section comprises excellent Phaser, Distortion, Spring Reverb and Delay modules. Bazille is packed with an awful lot of stuff, yet still it manages to be more than the sum of its parts: its clever architecture make it fun and creative to program, its superb, utterly convincing 'analogue' sound marks it out as a brilliant production tool, and its broad array of features give it extraordinary flexibility and obvious longevity. It stands as a genuinely viable alternative to a hardware semi-modular system, being more powerful in some areas, and far cheaper and more convenient. For synth connoisseurs, then, Bazille represents pure, unadulterated bliss.